Budget phone to replace the Galaxy Portal already? Samsung has shown off the new Galaxy Apollo - a presumably new budget handset that may be ready to replace the Portal. The phone has also been added to the 'Coming Soon' section of Orange's website, with a few specs that show it's unlikely to worry fans of the forthcoming Samsung Galaxy S.
The eagle-eyed chaps at Pocket-lint spotted the phone on the official Samsung site, and although there's very little information emanating from the Koreans about the phone. 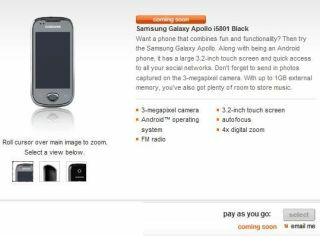 Thankfully Orange is being a little forthcoming - the Samsung Galaxy Apollo will have a 3.2-inch touch screen and 3MP camera, although worryingly it also states 'up to 1GB of external memory', which would place it squarely alongside phones circa 2006. Beyond that there's very little information floating about the mobile phone ether - it would be an odd choice for Samsung to release another phone like this unless it's a really budget offering. The latter seems likely given Orange is already listing it as soon to be available on pay as you go and free on contract, although we have no UK release date or pricing as yet. We've harassed everyone we can think of about who might know something about this, so if we get any answers we'll update the story so fast you won't even notice it's happened.